A bunch of Random thoughts... Business is picking up and if we can manage the many parts shortages I should be able to fill in the LLC $ hole I dug in 2009 and even do some modest development. Toward that end I've been working on several things. 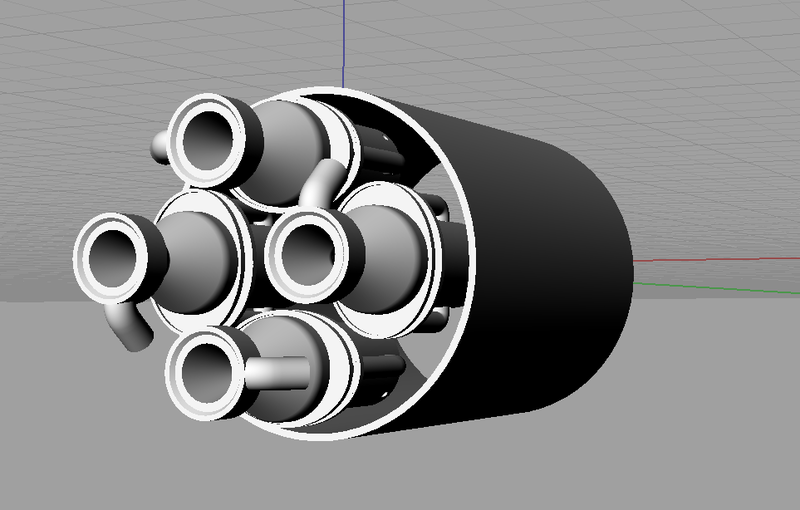 The four motors shown in the back of the rocket two blog posts ago are meant to be 3D printed with built in cooling passages. I had a plastic version I was showing at Space Access, the Metal version I ordered arrived today and it looks really good until you try to pass fluid through the cooling passages they are all plugged with sintered metal. Its a really pretty $400 paperweight. I may have to build in a conventional way or change to a more expensive 3D printing process. EOSINT 270 M, but that process is about 5 or 6x as expensive. But Paul, just use a Kalman filter. This has been done before already many times. I don't buy it's not intuitive or much harder than an ad-hoc method. It really is pretty straightforward. What cheap GPS and MEMS are you looking at? The Analog Devices ones? I'm going to fly a ADIS16400 the analog devices 3 Gyro, 3 Accel, and 3 Mag sensor. Also I'm evaluating the much lower cost sensors on the Spark Fun 9DOF IMU. Kidding aside at some level I need to see a block diagram where I have an intuitive grasp of what is happening in each box. The output from the raw gyro sensors are rotation rates. These clearly need to be integrated to get some concept of orientation. maybe one does not need orientaion, only rates?. Paul: I agree--I know enough to know that Kalman filters are the Right Thing, but I've never found a readable reference describing theory and implementation. Ian: do you have any suggestions? For a short duration, high acceleration rocket the IMU can be just 3 gyros. People who sell IMU's don't like us talking about it because they depend on 6 & 9 DOF sales, but the 3 DOF IMU has been the most reliable. I just sent you an email with a small initial explanation. The best book I've seen on GPS/INS Kalman filtering is Applied Mathematics of INS by Rogers, and I've seen a lot. I like it because it covers everything you need including examples, and it includes a good filter (although it is missing implementation details). I have other books that go into more details about implementation but I wouldn't recommend those unless you really want to get into navigation. Do you have some pics of the motors that you could publish on your blog? It's unfortunate that unbound powder got trapped into the cooling passages. Was the machine operator aware of the nature/function of this part? From what I could see about this printing process on Youtube, it looks like he wasn't able to vacuum unbound powder out of these cavities before putting the motors into oven. Paul I have the Kalman filter we use on the X-Prize lander we made for Frednet. I can send it to you if your interested or just hand it to you when I see you at FAR. Three days in the desert.